After months of anticipation, a date has been set for the general release of the highly-demanded Horse of the Year Show (HOYS) 2014 tickets. Fans will be able to purchase their tickets from Thursday 6th February, while previous visitors will be given access to an exclusive pre-sale (terms & conditions apply – see booking website) from Friday 31st January 2014. The organisers are looking forward to welcoming 60,000 visitors to Birmingham’s NEC from Wednesday 8th October – Sunday 12th October for another exceptional Show. 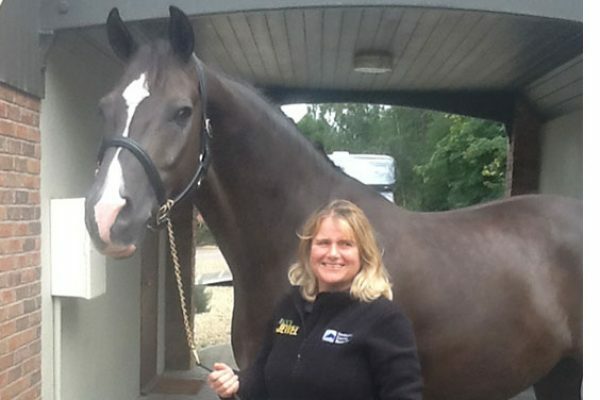 Petplan Equine, the UK’s leading specialist equine insurance provider, has announced dates for the 2014 ‘Petplan Masterclass with Lucinda’ series of cross country clinics. This year, the hugely popular masterclasses, formerly known as the Petplan Equine Lucinda Green XC the Safe Way clinics, are being conducted at equestrian centres across England from 2nd to 9th March inclusive. Those aiming to kick off their season in style can choose from seven coaching masterclasses taking place at venues across the country from Surrey to Yorkshire and Cheshire to Cambridgeshire. 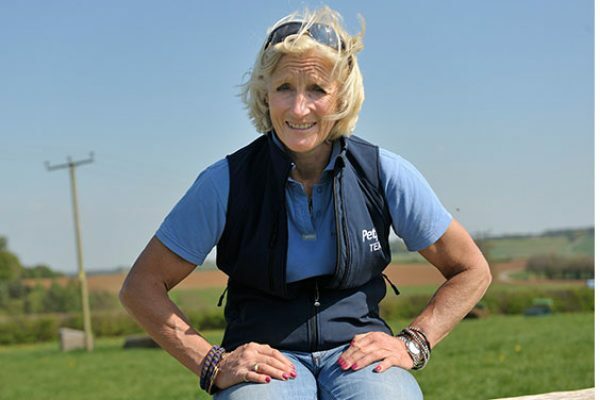 Riders will have the opportunity to be trained by and receive advice from former World and European champion, Olympic silver medallist and six times Badminton winner Lucinda Green MBE. Do you have what it takes to join the Horseware Riders Team? 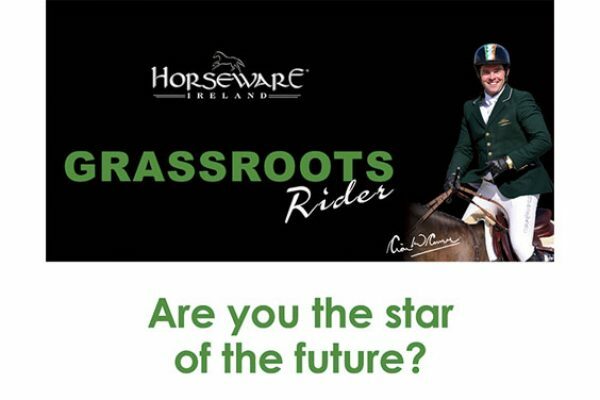 Horseware are searching for a grassroots rider to join their prestigious Riders Team for 2014. The winner will get a full sponsorship deal worth €10,000 (or equivalent) including personalised Horseware kit for horse and rider, a private clinic with a top Horseware rider, tickets to major Horseware sponsored events, and support and promotion from the Horseware social media team. 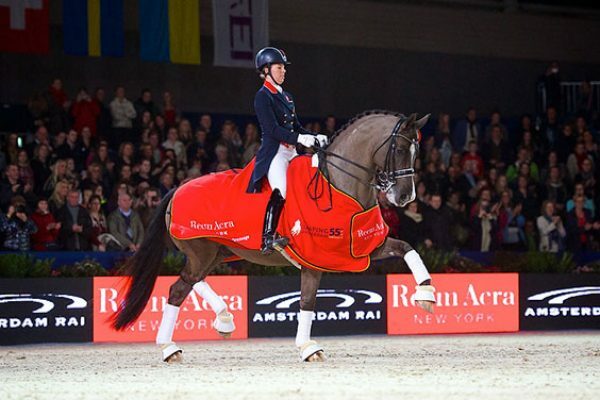 Great Britain’s Charlotte Dujardin and Valegro were like an unstoppable force as they marched to another spectacular victory at the fifth leg of the Reem Acra FEI World Cup™ Dressage Western European League series in Amsterdam, The Netherlands today. With a mark of 91.275, the Olympic double-gold and individual European Championship winning partnership were 2.7 points short of the world-record Freestyle score they posted at the previous leg at Olympia, London in December. But today’s result underpins their position at the very top of their game, and sets them firmly on the road to the Reem Acra FEI World Cup™ Dressage Final at Lyon, France in April. Entrance to Horse of the Year Show (HOYS) hunter qualifiers will be open only to members of the British Show Horse Association (BSHA) with immediate effect. The decision has been made following overwhelming requests from competitors and exhibitors to retain personal choice regarding headwear. Previously, members of Sport Horse Breeding of Great Britain (SHBGB) were the only persons eligible to compete in Horse of the Year Show hunter qualifiers and finals. However, a recent rule regarding headwear in hunter classes was made by the society. This rule change requires SHBGB members to wear a harnessed hat conforming to current BSI or European standards at all times while competing and mounted in its classes. Does your vet deserve an award? Has your vet gone that “extra mile” for your horse? Would you be lost without your vet’s support? If so, there’s still time to nominate them for a Petplan Veterinary award. Call for grooms and their employers to take part in a survey! 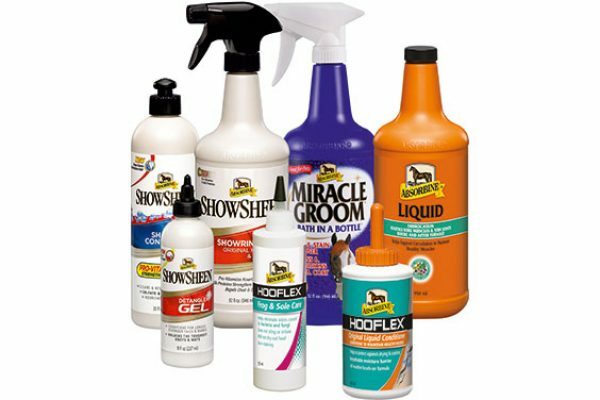 Leading horse care products company Absorbine is pleased to announce its support of The British Grooms Association (BGA) equestrian employment survey. The survey has been set up to help unveil the truth behind employment trends within the sector. As the professional membership association which represents the career interests of grooms, the BGA is urging all those who work with horses to come forward and have their say. Saracen Horse Feeds and the British Horse Society have joined forces to provide a series of training modules on equine nutrition. The course which starts in March 2014 will be available to anyone from the professional groom, to the everyday horse owner. 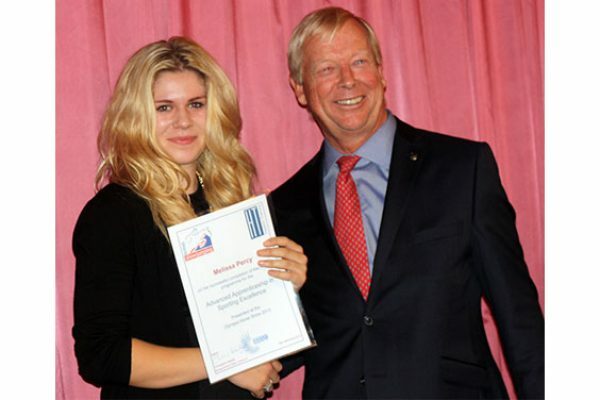 Hampshire Showjumper, 19 year-old Melissa Percy from Ringwood Hampshire received her British Showjumping Advanced Apprenticeship in Sporting Excellence (AASE) at Olympia, The London International Horse Show on Wednesday 18th December 2013. The certificate was presented by Rob Hoekstra, World Class Showjumping Performance Manager.